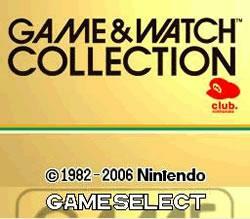 Game & Watch Collection on the Nintendo DS is a game bought out for Club Nintendo members. It features three of the game and watch multi-screen games: Donkey Kong, Green House and Oil Panic. The games featured are unchanged ports of their original versions.